TEMECULA, Calif. (September 7, 2018) — The Kurt Caselli Foundation (KCF) is proud to announce the Foundation’s first open registration for a First Aid/CPR certification and training course with instruction from Life Goes On at Fox Racing’s headquarters in Irvine, California. The course will take place from 9:00 AM to 2:00 PM on Sunday, September 16th with a catered lunch. You can reserve your spot today with a $25 donation at https://give.classy.org/Riders1stResponders. 100% of your donation will go directly to the KCF and help fund future safety initiatives. The KCF will be funding the majority of the cost for each participant as the CPR/First Aid certification and lunch is a $175 value — saving you $150, you don’t want to miss this opportunity! The Kurt Caselli Foundation’s mission is Protecting and Supporting the Lives of Off-Road Riders. The Foundation has budgeted allocations and planned safety projects for 2018 and years beyond, setting this year’s safety budget to $120,000 to host and support safety events and fund educational scholarships for riders. “We are grateful to the Kurt Caselli Foundation for all that they have done and continue to do for off-road motorcycle riders. This First Aid/CPR certification training is another great example of that. The KCF is also providing support for the EnduroCross Emergency Team at each event. EnduroCross flaggers are proudly using the KCF caution flags and doing what we can to help spread the word on this great organization.” – Lance Bryson, Director of Special Events, Bonnier Events Group. This event is made possible with your donations and the support from EnduroCross and Fox Racing. Erica Kurowski and her sister Morgan run the Southern California chapter of Life Goes On. 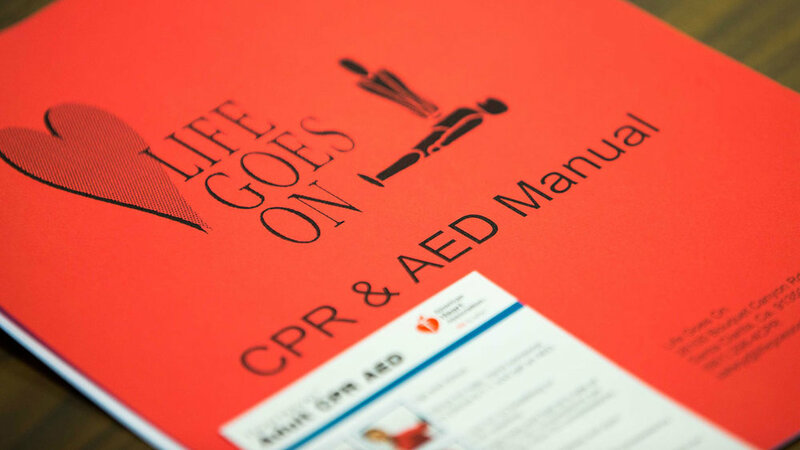 Life Goes On offers a fun, interactive CPR, AED and First Aid certification course in accordance with the American Heart Association (AHA) First Aid CPR AED Program. For more information or to schedule your own group certification class with Life Goes On, please visit https://www.facebook.com/socallifegoeson/. Round two is coming up on Saturday, September 15th at the Orange County Fairgrounds in Costa Mesa, California. This will be a first-time event at the facility that is well known for hosting motorcycle speedway events. The Sand Sports Super Show will also be taking place at the Fairgrounds, making this a great off-road destination for the weekend. Get your EnduroCross tickets at www.endurocross.com/buy-tickets. EnduroCross includes classes for Super EnduroCross (Pro), Amateur, Vet 35+, Women’s and TrialsCross. Plus, the SoCal event will include a District 37 club class. Riders can sign up for the remaining races here: https://secure.tracksideprereg.com/endurocross. The Kurt Caselli Foundation is focused on improving the safety for off-road motorcycle riders and racers. The EnduroCross flaggers are proudly using the Kurt Caselli Foundation caution flags in 2019.